It's been a good year for independent films. Documentaries and low-budget productions such as "Super Size Me," "Napoleon Dynamite" and "Open Water" have played to mainstream audiences. Zach Braff's "Garden State" is still running at Garden State multiplexes. And even Michael Moore never expected to take in more than $100 million with his polemic "Fahrenheit 9/11." "It's a great time for independent films," Rusin said. "With the advent of DVD distribution, many films are being shot digitally on video and going direct to DVD. We're bypassing the filmic process. It allows first-time filmmakers to actually make a film without major Hollywood backing." "The films are sent from all over the world, and these are the finalists," she said. Past entries have gone on to be aired on HBO or PBS, or have been released on DVD, she said. "We look at it as a long-term relationship," Rusin said. "We help them down the road, put them in touch with distributors, watching them grow from their first feature film to many other endeavors." "Our theme is 'Changing the world one film at a time,'" Rusin said. "We're bringing a lot of important concepts to the ordinary person and showing them films that they would never have an opportunity to see. In essence what you're doing is bringing the world closer together." The Sunday 2-3 p.m. time slot will present three short films appropriate for children 6 and over, including Rusin's own "One Last Cup: Closing Day at Hartung's Store," about the last day at a local Hope institution. The festival will present its DreamCatcher Awards to three filmmakers: Irish television news correspondents Jim Fahy and Caroline Bleahen, whose documentary "September 11th: Stories from the Twin Towers" won an award at a previous Hope festival, and Polish-born PBS documentary maker Slawomir Grunberg. Fahy will be present to answer questions from the audience after a screening of his new film "Assassination: The Death of Archbishop Michael Courtney," about the killing of the Pope's ambassador to Burundi. During the weekend, the antique stores and shops of Hope will be open and will feature the theme "Movies and Memorabilia." The Hope Township PTA will sell refreshments during the event. "We were told seven years ago that you can't do this in Warren County, and we've proven them wrong," Rusin said. New Jersey filmmakers James Hannon and Leon Leybs found their subject close to home. Hannon is the webmaster for Richard and the Young Lions, a 1960s garage rock band whose members regrouped 35 years later. The band's 1966 single "Open Up Your Door," with its fuzz-tone bass and driving beat, was a regional hit that never broke out nationally. Still, it made them stars in places such as Detroit, where they played to 18,000 fans at Cobo Hall, second billed to the Temptations. Hannon, a computer programmer from Scotch Plains, saw the group's story as a good vehicle for a longer film than the shorts he had been making. 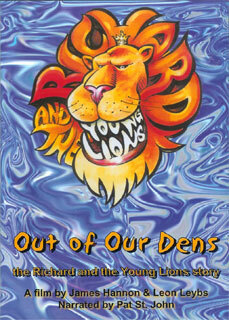 The result was "Out of Our Dens: The Richard and the Young Lions Story." The Hope festival will screen it today at 8:30 p.m.
"As time went on, a lot of cool things happened," Hannon said. "Getting Pat St. John on board was great." The veteran disc jockey, a fan of the band since the '60s, narrates the film. As it turned out, Hannon said, "he lives in a big house in Montclair three blocks away from where the band rehearses." With the help of another fan, E Street Band guitarist Steve Van Zandt, the group recorded a reunion CD of new material. But in June, after the film was completed, lead singer Howard "Richard" Tepp died of leukemia. The group went on to perform at Van Zandt's International Underground Garage Festival in August and still hopes to release the CD. As for the film, Hannon is just glad Tepp got to see it before he died. "This was a personal project for me," Hannon said. "Will I sell a million copies? I highly doubt it." Music is also the soul of Canadian filmmaker Lalita Krishna's "Chaos, Chords and Karma," which will be screened Saturday at 3:30 p.m. Her documentary follows eight teenage musicians who come together at a community center at a Toronto housing project. The center's director challenges them to form a band, raise money and take their act to India, where they are to perform a benefit concert for an organization that shelters homeless children. Krishna, who worked for Canadian television before forming her own company, previously made "Ryan's Well," a film about a 6-year-old boy who set out to help an African community dying from lack of clean water. "That's when my own focus shifted to young people doing extraordinary things in the world," she said. "I've been looking for stories like these." She and her small crew were present through every step of the teens' journey, and though at first some of her subjects might have felt self conscious being filmed, "soon you become part of the scenery," she said. "They don't even notice us." "If you give kids the opportunity to think of something outside themselves, they make life-altering decisions," she said. Young people are the focus of the short dramatic film "Day of Independence," which will be screened Saturday at 3:30 p.m. Set during World War II in a camp in which the U.S. government interned Japanese-Americans, the film uses a July 4 baseball game as the backdrop for a young man's relationship with his parents, who are returning to Japan without him. "A big part of what happened in the camps was how hard the parents tried to make those barracks a home," director Chris Tashima said. "They created their own life behind the barbed wire. It was a great attitude." Tashima not only directed but also plays the role of the umpire, who addresses the camera several times with homespun ballpark wisdom. This device and the film's distinctive look (processed in the lab to desaturate the colors, producing an aged or period feel) give it the quality of a dream or a fable. It softens a subject that might otherwise have gone in a dark or angry direction, Tashima said. "We deliberately chose a different route, with baseball and dancing and those kinds of things," he said. He and writer Tim Toyama had previously collaborated on "Visas and Virtue," a short film about a Japanese diplomat in 1940 Lithuania who helped Jewish refugees escape the Holocaust by granting them visas - against the orders of his own government. That film won an Academy Award for best dramatic short film in 1997. The Oscar ceremony, of course, was a big thrill. "My parents were there, Tim's mother was there, it was terrific," Tashima said. "It ended up doing some great things for that film, which is still playing in festivals." "Certainly with the Patriot Act and many other things the government was doing against Arab Americans and Muslim Americans was very reminiscent of that wartime racist hysterical attitude," he said. "Everyone in the Japanese American community immediately recognized what was happening. Our government made this mistake once."